We launched the new STEAM Lab at the Taos School of Integrated Arts with a series of Twirl workshops. 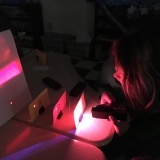 Students from grades K-5 participated in Light Play, which allows them to play, explore and make discoveries with light. 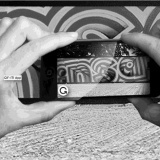 Augmented Reality (AR) Mural Work/Study Project providing real-world community focused learning of STEAM skills. Students create an Augmented Reality (AR) mural at Ziggie's Yoghurt Shop that makes the whole space interactive. By pointing your smartphone or iPad at the painted mural on the walls, animated images pop off the wall for a fun and surreal 3D experience. The main star of the mural is Ziggie, the adorable pug of owner, Bowe Ellis. Yoghurt will never be the same! 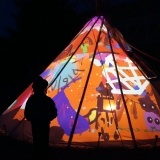 Interdisciplinary 3-Day Workshop with CERN and Lakota Cultural Specialist. 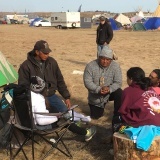 What happens when a physicist from CERN, a Lakota water protector, a Tewa educator and a new media artist meet with 26 Taos fourth and fifth graders? Perhaps, opposing worldviews will converge to create a new balance in the universe! The STEAM Lab@TISA founded in the fall of 2016 is a collaboration with the Taos Integrated School of the Arts in Taos, New Mexico to design and coordinate programming and curriculum integration for an innovative new STEAM Lab. The STEAM Lab@TISA is designed to support and engage TISA’s teachers and culturally diverse students in grades K–8 with age appropriate workshops, activities and technology that combine Science, Technology, Engineering, Mathematics and Art (STEAM) for Social Practice. Students participate in local, national, and international design projects through interdisciplinary collaborations. Working in partnership with TISA’s Arts Curriculum Coordinator, Megan Avina Bowers and with the full support of School Director, Richard Greywolf, TISA is the first school to implement the STEMarts methodology as a school-wide initiative with classroom teachers fully invested in daily curriculum integration of STEAM initiatives. The STEMarts method builds on eight years of successful STEM+art curriculum design and will be a unique opportunity for participating students and parents. As part of our 2017 programming TISA’s STEAM Lab is launching a pilot collaboration with QuarkNet@UNM and ATLAS Experiment at CERN to introduce advanced concepts in particle physics to elementary grade students through sci-art projects. The STEAM Lab@TISA is an innovative school model designed for students living in the rural community of Taos to access cutting edge art, science and technology and 21st century design thinking. The STEMarts Model is based on carefully designed media-rich workshops, hands-on demos or community interventions built on instruction with four design pillars that revolve around the core principle that all content must make a connection to self-reflection, society and our place in the universe as a whole. The leading innovation is the foundational principle that authentic and meaningful integration of science and art as social practice results in deeper learning, greater student engagement by students in both science and art, and the creative application of science and technology in their lives and in their communities. Activities are always ‘maker focusedʼ and revolve around project-based design challenges delivered by artists, scientists or interdisciplinary guests in collaboration with classroom teachers. Building from this unique starting point, the instructional design model intentionally connects the STEMarts Learning Model’s four pillars of instructional design to key activities and tools in order to impact student learning and attitudes. New Media Arts and Social Practice. Students engage with this new art genre that focuses on social engagement, inviting collaboration with individuals, communities, and institutions in the creation of participatory art. Students explore art as process and ‘way of knowing’ in correlation to the scientific way of knowing. We explore the latest digital ‘maker’ tools to engage and inspire art making with purpose. Complex Science concepts. Through virtual and real collaboration with interdisciplinary experts and creative applications, students explore complex science concepts. The goal is to a) expand students’ understanding of who we are, where we come from and our place in the universe, in what is now called the Golden Age of Cosmology and b) demonstrate the personal, social and global impact of science applications on their lives, while empowering them to be global citizens and caretakers of the planet. 21st Century Skills and Technology. Students learn to harness their creativity and develop critical thinking and innovation skills around interdisciplinary topics of interest. Through this process they get access to cutting edge technologies that peak their curiosity and blur the boundaries between science and art. Students learn valuable new tools that build job skills for the global workforce. Activities are aligned with Partnership for 21st Century Standards (P21). Real World Application and Collaboration. The work created through the program always has a connection to a real event in the local/global community. Students experience real world learning and community activism through participation in art and science festivals and local/global events; real and virtual. The STEMarts Curriculum is aligned with The Next Generation Science Standards which include four core ideas in the physical sciences: PS1: Matter and Its Interactions, PS2: Motion and Stability: Forces and Interactions, PS3: Energy. PS4: Waves and Their Applications in Technologies for Information Transfer—which introduces students to the ways in which advances in the physical sciences during the 20th century underlie all sophisticated technologies available today. 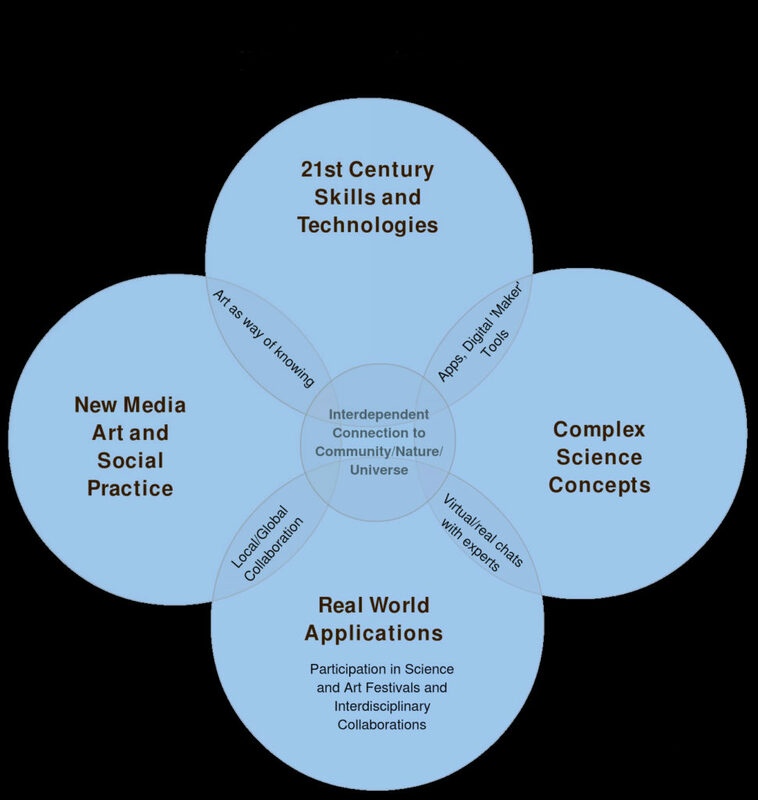 In addition they include a framework that relate science, technology, society and the environment: the interdependence of science, engineering and technology, and the influence of science, engineering and technology on society and the natural world.